It seems that everyone loves the country of Georgia. You can barely mention it without people piping up to say how startlingly beautiful the Caucasus mountain villages are, or raving about meats grilled over grapevines, the generous use of walnuts and pomegranates, or internationally beloved acharuli khachapuri, fresh baked cheesebread with a raw egg on top. But what they may leave out is how cheap it is — especially true since the lari has lost 20 percent of its value since last summer. Most trips to Georgia start in Tbilisi, the capital city of a million or so that for American travelers is both reassuringly familiar and genuinely exotic. The streets could be European, but what’s that gorgeous alphabet the signs are written in? The national religion is Christian, but women cover their heads in churches with no pews. Georgians love bread and cheese but sometimes crack a raw egg over it. Here are some tips on getting the most out of the already frugal traveler-friendly city. You could pay $200 and change at the Courtyard by Marriott looking out on Freedom Square and its gilded statue of St. George atop a pillar. But in the eight-plus years since the statue went up (which was, in turn, 15 years after a statue of Lenin was torn down) affordable guesthouses have opened across Tbilisi, including ones right near the square. I stayed in Tina’s House, tucked away on a nearby residential street, for 70 lari a night including breakfast. The Muradashvili family has lived there for decades; it’s full of portraits painted by Tina’s nephew, and clocks collected by her husband, Zviad. The beds at the Marriott are better, but the guesthouse is also close to the metro and a 10-minute walk to the old city. A Georgian friend of mine in New York told me in advance that taxis in Tbilisi are “stupid cheap.” I actually ended up walking almost everywhere, and took the metro (half a lari) when I didn’t. But the few times I did use taxis they were indeed stupid cheap: Getting anywhere around the city center will run you 7 lari max at most. Even a run from the airport to the central part of the city is only 25 lari. Since I was arriving after midnight, I accepted Tina’s offer to send her husband to collect me for 30 lari; when I cleared customs I found him holding up a piece of paper with my name — a first for me. Somewhere in this city, I’m sure there are expensive restaurants. But at most restaurants serving the sort of hearty, meaty (but also vegetarian-friendly) Georgian cuisine you’re looking for, order freely. Twenty lari will get you a feast, as at the popular chain Shemoikhede Genatsvale, where I had tasty pork ribs in a slightly spicy adjika sauce for 14 lari. At Machakhela, which looks like a fast-food spot, baked-to-order acharuli bread filled with an eggplant stew goes for 5 lari; at its table-service branches — sometimes listed with the name Samikitno — traditional wine fermented in clay pots called kvevri starts at one lari per generous pour. I even went upscale one night when a friend of a friend invited me to a place called Azarphesha, and after two bottles of wine and a spread that included a delicious Georgian-style mushroom and herb polenta, whole trout, moutabal (an eggplant purée) with pomegranate seeds, and wine for about 60 lari a person. The smaller Museum of the History of Tbilisi (3 lari) is a bit mustier, but has an interesting collection of old musical instruments, life-size mock-up of an old city block, and obsolete household items, which are always entertaining. A highlight is an old Underwood typewriter with Georgian keys that looks as if it should be used to type up ancient magic spells. 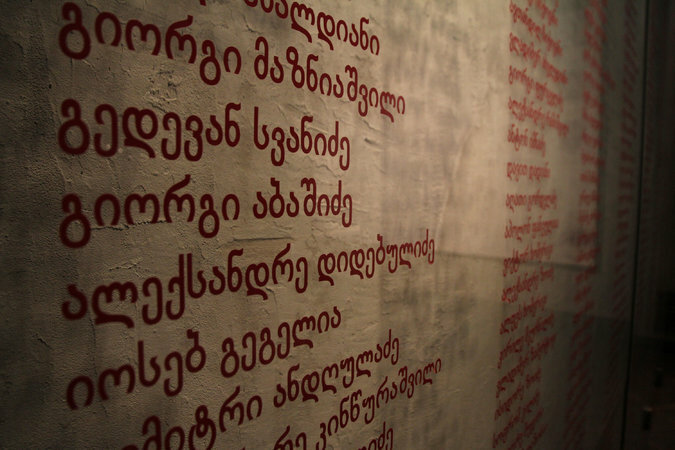 The Georgian tradition of polyphonic singing is deservedly inscribed on Unesco’s Intangible Cultural Heritage list, and unlike its traditional wine (whose methods are also inscribed), you can experience it for free, either in restaurants or Tbilisi’s several ancient churches. I attended a service at the Anchiskhati Church, where a choir of four men stood in a tight circle, facing one another and singing in deep concentration. I’m not much of a shopper, but who doesn’t enjoy a good flea market, especially when so many items are from the Soviet era. That’s what you’ll find at the Dry Bridge, an old town bazaar, where I even found the perfect gift — for myself: Russian-made versions of albums by the Beatles, Rolling Stones, Louis Armstrong and others to bulk up my nascent vinyl collection for between 5 and 15 lari each. It may be missing the après-ski bells and whistles of resorts in the Alps, but the wide-open runs at Gudauri, about 75 miles from Tbilisi, are extensive, easy to get to, well cared for and, at least on a weekday, without lines. The views are every bit as spectacular as well. Or so I hear — during my visit, heavy snow created near white-out conditions. But it sure was cheap. The marshrutka (or minibus) to and from Tbilisi cost 7 lari each way, equipment rental was 25 lari and a lift ticket was 30. I subsisted on snacks, including my first taste of churchkhela, stringed nuts dipped in a sort of thickened grape juice. The total cost of my day was about 75 lari, or about $35, less than one-quarter the cost of a lift ticket alone at Vail.